The BBQ is a great American tradition, where food is cooked outside, shared, and eaten in a most casual of fashions, whether a gathering in a backyard, a park, the beach—even a parking lot or a rooftop. Hot dogs and hamburgers may first come to mind, but there are so many other ingredients that are great on the grill and served to a crowd. From steaks to pork to shellfish—along with plenty of traditional side dishes—you have plenty to choose from for a successful cookout that will please friends and family. Because of their hefty price tag, steaks are not at every BBQ party, but people sure do get excited when they see cuts of beef sizzling on the grill. Before you can think about how to grill the steak, however, you need to be sure to buy the right type and best cut of meat. Then you need to treat them right: Bring steaks to room temperature, give them a generous sprinkling of salt on both sides, set them on a hot grill, and once done, let them rest for at least 10 minutes for the juices to settle. When cooking burgers on the grill, the golden rule is to leave them alone. Don't flip them over and over, and definitely don't squash them with the spatula—when you press down on the meat, you're pressing out the juiciness. If you follow a few tips when grilling, you will end up with the perfect burger. Another tip is to ask your butcher to grind your meat (or do it yourself) for the freshest patty ever. Once you have the method down, you can apply it to any burger recipe, including vegetarian black bean burgers and mushroom veggie burgers. Real BBQ is a regional thing. What flies in North Carolina (some form of pork) won't look even remotely familiar in Texas, where beef brisket is usually slow-cooking on the grill. Whether you choose to cook tough cuts of pork, such as shoulder, over low heat for a long time rendering it supremely tender, or tender cuts—such as chops—quickly over higher heat, you'll impress your BBQ party guests with your versatility. Hot dogs are always a favorite at BBQ parties, but after the first few cookouts of the season, they can get a bit tiresome. For a change of pace, pop bratwurst on the grill, set up a condiment station, and a basket of buns, and call your work over. When you grill sausages, knowing what type of sausage you're using is a must so you know whether to cook them through or just heat them up. Fresh sausages need to be cooked through (they are raw meat), while cured or smoked sausages can usually just be heated up. If you choose to throw a few dogs on the grill, but would like to add a little twist, offer some unusual topping combinations at the condiment station, such as salsa and cilantro, bacon, lettuce, and tomato, and blue cheese and hot sauce. Chicken is usually a safe bet when it comes to feeding a crowd, but too often grilled chicken gets overcooked (for fear of serving it uncooked) and dry. Whether you're cooking chicken parts, the whole bird, with skin and bones or without, there's no reason for this popular cookout dish to be anything but juicy and tender—as long as you follow a few tips (these are mainly for chicken on the bone). First and foremost, generously salt the chicken as much as a day or two ahead of time (the salt helps the meat hold onto its own natural juices as it cooks). Before cooking, always preheat the grill, getting it nice and hot. (If you are using an indirect cooking method, make sure to leave one part of the grill unheated, creating a cooler area to cook the chicken.) Sear your chicken first to get a nice outer crust, then turn it once, and wait until the meat firms up before you test it for doneness. Remove the chicken from the grill before it gets rock-hard, cover it, and let it rest off the heat for 15 to 20 minutes before serving so the juices can settle back in. If you are grilling boneless chicken, marinate several hours ahead of time and grill for about 6 minutes a side. Kebabs provide a great way to feed a crowd with minimal fuss (especially if you have some small hands around that will help thread the skewers). You can make kebabs to please any type of eater—even vegetarian. Alternate chunks of marinated meat or fish with vegetables such as onion, bell pepper, and whole button mushrooms. Just be sure not to crowd each skewer so the food can cook fully and evenly. Because these items cook at different temperatures, savvy chefs cook meat on one skewer​ and individual vegetables each on their own skewers. When they are all done, slide ingredients onto a large platter and let your guests help themselves. Something about live fire and fresh fish is magical. While a whole side of salmon on the grill is a visually stunning delight and easy to cook (just put it skin-down, cover the grill, and remove when cooked—there is absolutely no need to flip it! ), it's just as easy to toss a few whole sardines or a few pieces of meaty fish on a grill, or use a fish basket to cook more delicate filets. When choosing a fish to grill, select a firm, fleshy fish such as halibut, ahi tuna, salmon, wahoo, grouper, and trout. You will want to oil the grill grates beforehand and keep an eye on the fish to make sure you don't overcook it. You may not think of grilling shellfish, but this cooking method is actually ideal for this type of seafood. Their shells protect their sweet insides from the heat, the fire adds flavor, and cooking them outside minimizes mess. All told, there are no reasons not to grill shellfish. Mussels, clams, oysters, lobster, and shrimp grill up beautifully and retain a wonderful smokey flavor. The traditional clambake—building a fire, heating stones, laying in seaweed, layering shellfish with potatoes, sausages, and corn, and topping the whole thing with more seaweed to let it bake—is a great New England tradition but a heck of a lot of work. You can create a similar culinary experience on a backyard grill by placing the ingredients in foil packets. Of course, the experience isn't the same, but the results are just as delicious. A ubiquitous side dish on any barbecue buffet table, coleslaw is classically made with hearty green cabbage and a creamy dressing. When eaten alongside grilled meats, it seems as if it were made for summertime cookouts. You can add color to your basic slaw by including red cabbage, shredded carrot, and fresh herbs, or make a coleslaw with a twist. If you're not a fan of mayo, then adding cream instead may be more your style, or a Carolina slaw that uses a vinegar base. For something a bit different, give Asian coleslaw, Serbian coleslaw, or Dutch Koolsla a try. Is it really a BBQ without potato salad? There are many people who would say "absolutely not." But that doesn't mean it has to be the same recipe every time. From an American classic with mayo to a loaded baked potato salad to a roasted potato salad, there are many different ways to make this fan-favorite side dish. Even a Chinese potato salad or Greek potato salad would be welcome alongside a traditional burger or dog. You can also create a recipe using grilled or sweet potatoes. It's a real shame that so many BBQ parties completely ignore all the great summer vegetables that are in season. Let's change that! At your next cookout, serve a seasonal summer salad taking advantage of the fresh produce at the market—or in your garden—adding some crunch and color to your BBQ. Try a tasty tomato salad, corn tomato basil salad, or a marinated green bean salad. Or bring some complex flavors to everyone's (paper) plate with a Polish cucumber salad, Spanish summer salad, or Thai cucumber salad. Along with tomatoes, sweet corn makes its own convincing argument for eating locally. Truly fresh, local sweet corn knocks the socks off corn that's traveled to get to you. Simple corn on the cob is a classic BBQ party food, and for a classic corn on the cob recipe, simply shuck it, drop the ears into unsalted boiling water, cook for 1 minute, cover, and take off the heat. The corn will keep warm without overcooking. When ready to serve, remove from the water, pat dry with a clean kitchen towel, and pile onto a platter. Accompany with plenty of butter and salt. But there are other ways to cook corn on the cob besides boiling, including roasting corn over a gas burner, slowing cooking corn in your smoker, and steaming on the stovetop. Of course, there's no reason not to try something new, even with corn on the cob. Grilled corn with garlic soy glaze will be delicious alongside any grilled meat or fish, and a nice change from butter and salt. If you're willing to remove the corn from the cob, you expand your options in some delicious directions such as corn fritters and corn relish. Need something besides coleslaw, potato salad, or another kind of salad? A great go-to side dish can be simple grilled vegetables. Brush them with oil, put them on the grill, flip until they're browned and tender, and sprinkle with salt. But we can't forget about good ol' baked beans. Whether Boston baked beans, vegetarian baked beans, maple syrup baked beans, or sweet and spicy bourbon baked beans, when homemade, they are sure to be a hit at your cookout. And if you're a fan of sauerkraut, try making your own. Giant bags of potato chips and bowls of peanuts are the standard fare for BBQ parties, but homemade snacks are a step up from store-bought and add a special touch whether you're a guest or the host. Try your hand at homemade potato chips, homemade pretzels, honey roasted peanuts, or even sweet potato chips. If you'd like to serve something a with a little more heft, nachos are always a hit at any party. Whether store-bought or homemade, all of those chips and pretzels are even better with a dip or salsa to dunk into—many of which can also double as sauces and spreads for the main course. Seven layer dip is always a favorite, as is a fresh guacamole. Perfect for summer (especially if you have a bounty of basil in the garden), homemade pesto is delicious as both a dip and a sauce. For a little Middle Eastern flair, add a baba gannouj or grilled eggplant dip to the menu, and for something different how about a jalapeno popper dip—a deconstructed version of the popular restaurant appetizer. Tzatziki, the Greek cucumber yogurt dip, is light and refreshing on a hot summer day, and perfect with potato chips. Salsas are made for BBQ parties. They work as an appetizer, as a condiment, and even as a salad when chunky. You can always buy them, of course, but homemade versions are so easy and fresh. Try avocado corn salsa, mango peach salsa, pineapple salsa, or salsa verde. When planning your summer cookout, having plenty of soft drinks on hand is always a good idea. But it's also nice to offer some other non-alcoholic beverages, such as a delicious iced tea or homemade lemonade. (You can let people combine the lemonade and iced tea to make their own Arnold Palmers.) Surprise your guests with green lemonade, which has a bit of kiwi for color and sweetness, or a mint lassis made with plain yogurt and fresh mint; both are amazingly refreshing. Cold beer is always welcome on a summer day, but if it's hot out, be sure to have plenty of water on hand and encourage your guests to partake. Flavorful beverages can delight and make excellent use of the fresh produce available in summer, bringing flavor and sweetness. Add a fruity note to some summer classics with a cherry gin and tonic. Very refreshing is a cucumber martini, which can be quite powerful so be sure to encourage your guests to try it on the rocks if it's hot out. Sangria is always fun at a party and can be made with a variety of fruits and flavors, such as raspberry lemonade sangria. For something different, serve a Pimm's cup, the classic British summer refresher, or a Tinto de Verano, literally "red wine of summer," a simple mix of lemon-lime soda and red wine. It goes down like lemonade so watch yourself! Summer is also the perfect time for a frozen drink, including Chi-Chis and Daiquiris, as well as red, white, and blue cocktails for all of the patriotic holidays of the season. No matter what kind of BBQ party you throw, be sure to provide way more ice than you think you could ever use. Dessert is the perfect thing to assign guests when they ask what to bring, but an easy BBQ party dessert is grilled fruit served with ice cream. If you're feeling ambitious, you can make the ice cream yourself! A homemade pie is another great summer treat and a great way to enjoy the season's fruit. Whether you buy the crust or make your own, a freshly baked fruit pie or two—from blueberry pie to peach pie to strawberry pie to sweet cherry pie—will definitely grab your guests' attention. If your cookout celebrates an American holiday, try a red, white, and blue dessert for a memorable highlight to your July 4 BBQ. 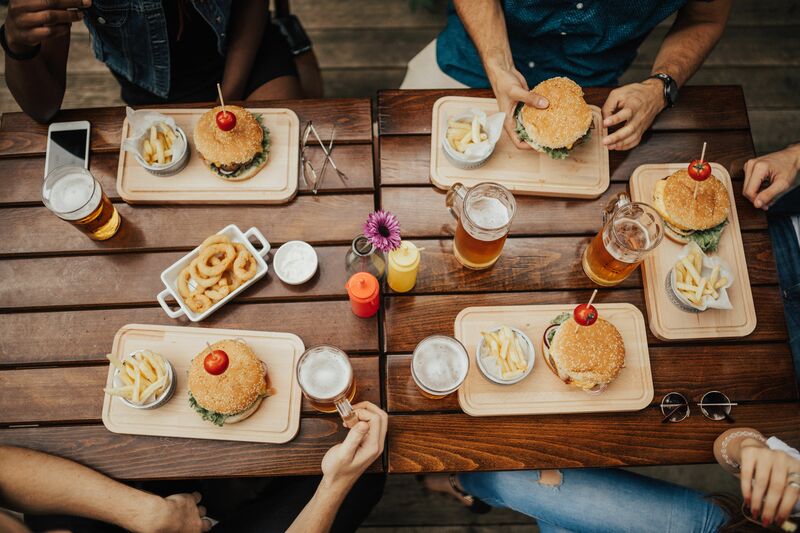 If you are feeling a bit overwhelmed by all of the barbecue choices, picking a themed menu can do the planning for you, or just provide a jumping off point for your own creation. Santa Maria BBQ is a California tradition involving tri-tip steak, beans, salsa fresca, green salad, and garlic bread while a Texas barbecue involves smoked brisket, ribs, beans, and plenty of iced tea. A Thai BBQ gives you both sweet and spicy all at once. If you are feeling ambitious, South American grilling includes Patagonia-style tenderloin and whole animal roasting, cooking whole pigs or lambs, is a delicious tradition in many cultures.